Here in Washington, D.C., “what do you do?” is the question. I moved to D.C. nine months ago and I still struggle to do my field justice. I can say that I help amplify the voices of women activists countering violent extremism and promoting peace around the world. I can describe the work of Fatima al-Bahadly, a partner in Iraq who has de-radicalized dozens of young men recruited by extremist groups and convinced her own son to lay down arms. But it still doesn’t seem enough. As a young woman concerned about the shifting priorities within the U.S. and rising violent extremism across the globe, I feel now more than ever it is crucial that people understand what I do and why it matters. Women, Peace and Security (WPS) work occurs at the intersections of feminism and the international peace and security fields. WPS work is anchored in the tried and true principle that a country’s stability is more closely linked to the status of its women than any other factor. (The better women are treated and the more secure their rights, the more likely a country is to be peaceful, prosperous and secure.) Professionals in the WPS field push for inclusive peace and security processes and emphasize the need for human security—including access to clean water, employment and quality healthcare—in contrast to the traditional security sector focus on protecting people from enemy threats with military force and weapons arsenals. The WPS field also prioritizes “positive” peace—i.e. establishing institutions and structures that promote peace—over “negative” peace—i.e. simply ending armed conflict. The ultimate goal of those in the field is—you guessed it—building a foundation for peace, and, at very least, resolving conflict nonviolently. The WPS field was born out of United Nations Security Council Resolution 1325, adopted in 2000 and pushed forward by women’s peace groups from around the world. UNSCR1325 recognizes that women and girls are uniquely and disproportionately affected by armed conflict; acknowledges women’s important role in conflict prevention, conflict resolution and peace-building and urges countries to increase the participation of women in decision-making related to war and peace. Taking their commitment seriously, 58 countries, including the US, have created national action plans to implement the resolution. To be fair, women are not the only ones that have been absent from the decision-making table. In fact, the only people who have always had seats reserved are elite (male) political and military leaders. With the changing nature of warfare—complex, internationally sponsored conflicts within countries as much as between—extremists groups like Boko Haram and ISIS are increasingly invited to peace negotiations. 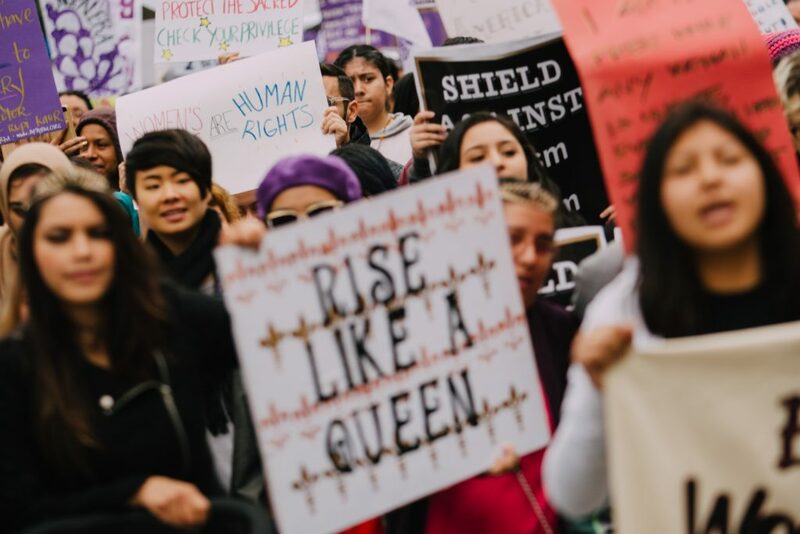 Unarmed civil society activists and community leaders, on the other hand, are often excluded—and civil society is the space where women are most active globally. With rising extremism worldwide, it is more important than ever that we have inclusive processes that prioritize the human security of all. And yet, it seems the U.S. is moving in the opposite direction. As part of its “America First” strategy, President Trump’s administration has expressed its intention to severely cut the State Department and USAID’s diplomacy and foreign aid budgets while channeling more funds to the Department of Defense and Homeland Security. 121 retired generals and admirals wrote an open letter advising against the cuts, highlighting the key role of the State Department and USAID in fighting Ebola and ISIS. Similarly, the Trump administration plans to completely abolish the United States Institute of Peace, which was created by Congress in 1984 to “prevent, mitigate and resolve violent conflicts around the world.” Among its peace-building activities is serving as the convener and secretariat for the US Civil Society Working Group on Women, Peace and Security. All of these institutions are under attack by the current administration, at least in part, in the name of national security. This in painfully ironic, because each of these institutions contributes to global stability and therefore serves the interests of US national security. An analysis of 181 peace agreements signed between 1989 and 2011 showed that peace is 35 percent more likely to last 15 years or longer when women are meaningfully included in the process, yet between 1992 and 2011 only 9 percent of negotiators at peace tables were women. Conflict relapse is a huge problem—a UN study shows that every civil war that started between 2003 and 2010 was a relapse of a previous civil war—and women make peace more sustainable by raising social justice concerns during negotiations, which helps ensure a country does not fall back into conflict because of unresolved issues. Women also help make sure decision-making bodies serve the needs of the entire population. We saw this with Colombia’s recent peace process, which is a model for inclusion: women were one-third of participants and over 60 percent of experts. Despite being left out of formal negotiation processes, women have been at the front lines of peace and security efforts from the beginning. I have had the honor of meeting some of these peace heroes. Hamsatu Allamin of Nigeria, or “Aunty Boko Haram,” counters the militarized group’s anti “western education” propaganda with her own message: boko halal; education is good. Visaka Dharmadasa of Sri Lanka convinced the Liberation Tigers of Tamil Eeelam to enter peace negotiations, which eventually resulted in a ceasefire. Robinah Rubimbwa of Uganda marched 80 kilometers to Juba, South Sudan to shape peace talks after 20 years of war with the Lord’s Resistance Army; she and other women marchers passed notes to the Ugandan government delegation, influencing the resulting peace agreement and subsequent peace recovery and development plan. These are the women who UNSCR1325 was written for. These are the women who must be included in conflict resolution and peace processes. They should not have to pass notes to be heard while someone else speaks for them. They are more than capable of speaking for themselves. I am tired of the cycles of violent conflict. I am ready for an alternative. WPS advocates and peace-builders provide that alternative. Women like Fatima, Hamsatu, Visaka, Robinah and so many other peace heroes provide that alternative.